I saw this propped up by the stairs, alongside the masks and other wooden carvings. Not just here in Goma, DRC or in Africa, but globally. In most cultures, it is the woman’s job to take care of the household … carry and care for the children … find a way to feed the household … sustain and nourish all others. The man? Well, the man is the one who works outside of the house, doing whatever he’s doing, sitting at a desk in his suit and tie, allowed to meet and greet strangers. 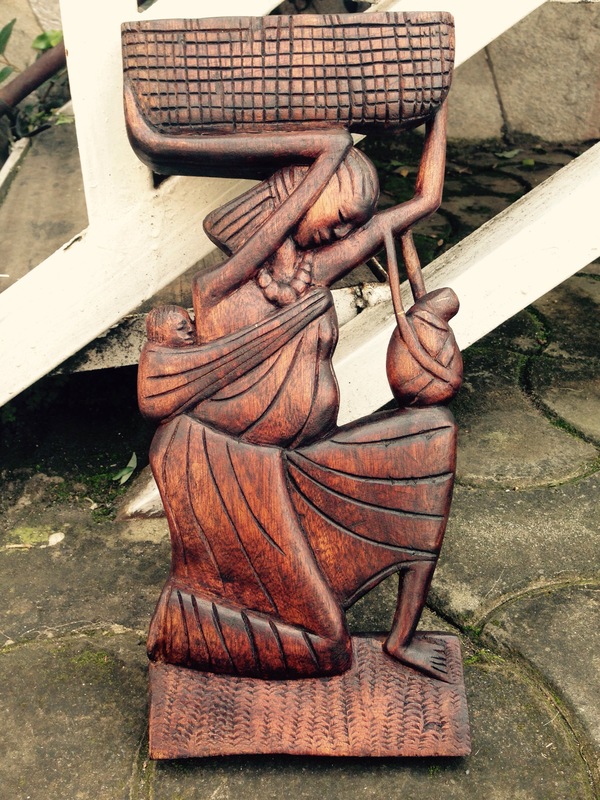 So this is Woman … Mother … Wife … carrying her child with her, even as she walks to the market with a basketfull of goods to sell … even as it seems that she is pregnant with another child … and carrying a waterbottle to sustain and nourish her along the way … Woman.